A luxury chalet is one of many traditional wooden lodges found in the scenic Alps of Europe. Most people don’t immediately place a luxury tag to a log cabin, but don’t be misled. Many of these chalets are spectacular and luxurious, in every sense of the word. While a luxury chalet may certainly look comfortable, it would be hard to say that a log cabin is in any way luxurious. Just like hotels, a winter luxury chalet comes in many sizes and categories. We want to share some of these luxury winter chalets that can stand up to any luxury villa and hold its own. It’s the perfect place for the entire family with it’s designer interior, private cinema room and pool. La Grande Roche in Corchevel (photo above) even comes complete with a home theatre. This three-level luxury Chalet is intended for an ultra-exclusive family vacation. The entire first floor is dedicated to space for children, with the remaining 550 square meters are a paradise for adults. Below ground, there is also a pool, fitness area, and yes, its very own private home theatre. This exclusive nine-room Chalet is connected to the five-star Hotel & Spa Aurelio by an underground tunnel. Yes read this correctly – a tunnel. In addition to the normal necessities of luxury Chalet life, this ski palace also has a 24-hour butler. Six double rooms, two junior suites and a master suite provide space for up to 20 people. In addition to the onsite wellness oasis, the fireplace in the library is an excellent place to curl up and relax. 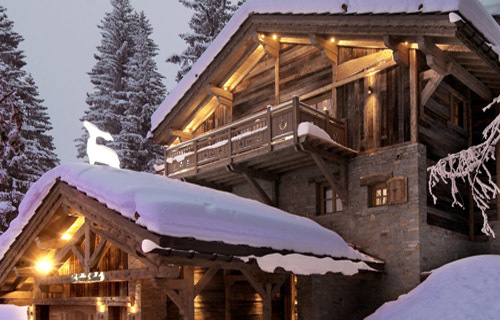 Here’s a winter chalet that is fit for even master spy James Bond. A true Alpine jewel, this luxury lodge has been nominated for numerous international design and architecture prizes. With a look that would make the perfect backdrop for a James Bond film, there are five bedrooms, a spa area complete with sauna, an outdoor whirlpool, fitness room, and an indoor pool. Whew. No need to be tired, there are four staff onsite that attend to whatever else you might need. Antique charm, paneled ceilings, and rich parquet flooring provide an impressive first look at this lovely Chalet, which is widely known as the most stylish in the entire region. From the generous main hall, guests can enjoy the stunning Alpine panorama, and despite the traditional atmosphere, rest assured that this 550 square meter hide-away is outfitted with all the modern technology you could need. A one-time convent, Chalet Ref. Voglite in Val d’Isere retains some of the air of seclusion necessary for its former duties to this day. That being said, there have since been some updates… An interior pool leads outdoors into the snow-covered mountain world. Sauna and massage room are both right next door, and each of the four bedrooms features its own private bath. Please contact The Life of Luxury to book your travel reservation and stay at a luxury chalet in the Alps of Europe. If you enjoy reading about luxury travel, then return and follow this popular luxury blog.